As I have written in my post ‘the unbearable adorableness of turfed existence‘, small plants are very easy to love. Members of the Bristlewort family (Centrolepidaceae) in particular, meet all the qualifications. Most are turfed and all are small, barely attaining a stature exceeding a few centimeters. For a number of years now I have been wanting to meet two specific members of the Bristlewort family, Aphelia gracilis (Slender Fanwort) and Aphelia pumilio (Dwarf Fanwort), particularly after I had seen illustrations and photographs of the two in The Student’s Flora of Tasmania Part 4B and The Nature of the Midlands. For one, the genus Aphelia is endemic to Australian, that is to say, unique to Australian soils. Secondly, both the dwarf and slender fanworts are rare plants found only in parts of the Midlands and in the Northeast. Adorableness and rarity. Such reasons are cannot fail to set off passions like rotating lights accompanied with sirens for plant lovers. Needless to say, it did for me. So great my desire was to see these two fanworts and so swift was my alignment to this desire that in one fell swoop, I saw the both of them in a single day when I visited the Tom Gibson Nature Reserve on a Threatened Plants Tasmania group excursion. The strange thing about these two plants is that there is little in the gist of it that would suggest that they are NOT sedges. Yet, they are so unique as to be recognizable at once. I shall explain. From every angle, these two plants look like small sedges of the genus Isolepis. 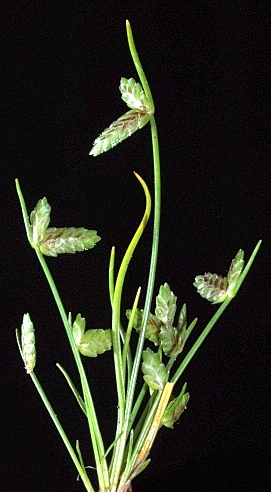 The single spike (the flower cluster, consisting of many overlapping bracts) is laterally flattened and in practically every sense resembles the floral parts of Isolepis or Cyperus. When we come to this point we have got to stand in awe of the detail that plant taxonomists put into describing plants. 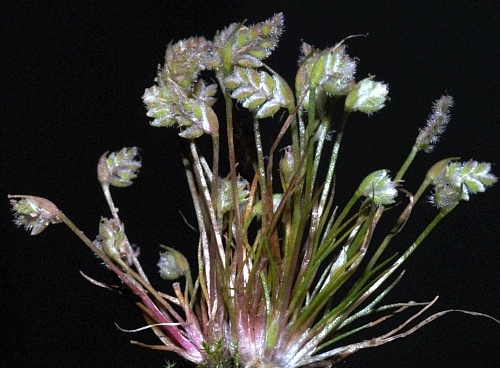 The Bristlewort family is probably best distinguished from sedges by their fruits. Bristleworts have dehiscent fruits, meaning that the fruits split open to expose seeds at maturity. The fruits of sedges, on the other hand, are indehiscent nuts. This fruit characteristic of Aphelia is difficult if not impossible to see in the field. Moreover, these plants are so small that you’d need a microscope in the field at the time of fruit maturity to look at it – not very logistically appealing for an afternoon walk. On my plant hunt with Richard Schahinger of the Department of Primary Industries, Parks, Water and Environment (DPIPWE) and and other members of the Threatened Plants Tasmania group, we stopped at a small soak in the Tom Gibson Nature Reserve to look for ephemeral plants. It was not long before the keen and experienced eyes of Richard sighted the Slender fanwort. The Slender fanwort (Aphelia gracilis) can be easily confused with sedges. 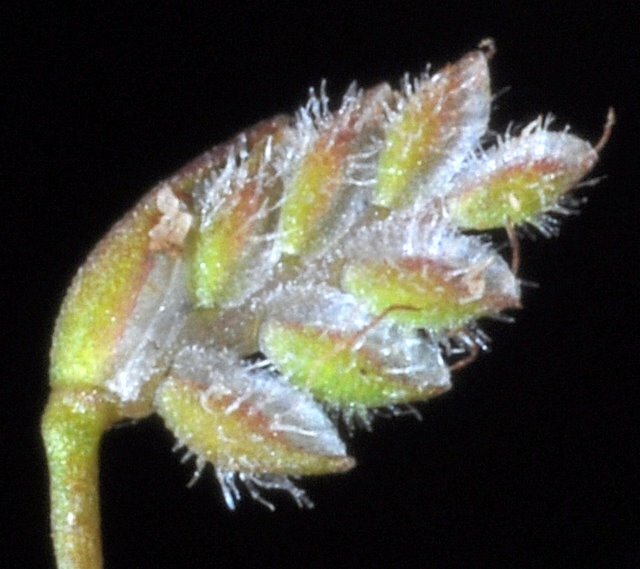 In particular, the common Tiny Flatsedge (Isolepis levynsiana), which we found co-occuring with the Slender fanwort, has flower parts that look very similar to the spike of the Slender fanwort. 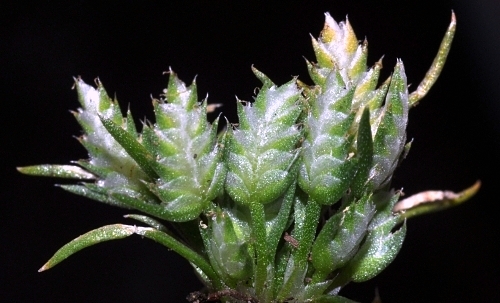 However, upon closer examination, the hairy bracts of the Slender fanwort immediately distinguish it. Moreover, the Slender fanwort is often brownish-pink in all parts of the plant. I was not quite as fortunate with the Dwarf Fanwort, managing only to find patches which had already dried out and died. However, Mark Wapstra had found some fresh specimens at another site in his earlier plant hunt and showed it to those around. It was as curious in real life as it looked in photos and illustrations. Dwarf Fanwort is instantly recognizable by the pompous spikelets that practically dominate the plant body. Sometimes the flowering stalk may be taller Even if the flowering stalk. There is nothing else like it in Tasmania and there certainly is no sedge with such a disproportionate spikelet/plant body ratio! I haven’t had the chance to ask Mark, a co-author of the Little Book of Common Names for Tasmanian Plants what prompted them to call Aphelias fanworts. Perhaps they likened the floral parts to an open fan. I’d prefer to think that the Aphelias are called fanworts because diminutive and inconspicuous as they may be, they have that inexplicable power to make fans of plant lovers, as they have of me. This entry was posted in Fieldtrips, Plant Appreciation, Plant Morphology, Threatened Plants and tagged "Tiny Flatsedge", Aphelia, Aphelia gracilis, Centrolepidaceae, Dwarf Fanwort, Isolepis levynsiana, Slender Flatsedge, spike. Bookmark the permalink.